Add a tropical flair to your home for your next summer party by making an eye-catching vase out of a pineapple that will give your home a lovely smell of fresh pineapple.This is a super simple project that takes regular store bought flowers and fruit into a flower arrangement that looks like it was made by a professional florist! Using a chef's knife cut off the top of the pineapple by laying the pineapple on its side flat on a cutting board. Throw out the top of the pineapple. Using a spoon begin scooping out the middle of the pineapple to make enough room for the paper or plastic cup. As the inside of the pineapple is hard you will need to use a small paring knife to cut away the center hard areas. All the removed interior fruit of the pineapple can be disposed of or eaten once removed from the pineapple. Test placing the cup inside the pineapple. If it does not completely fit continue scooping out more of the middle of the pineapple. Once the cup fits entirely inside the pineapple fill the cup up with water. Fill the cup with your choice of tropical flowers. As the vase is rather short you will need to use scissors to cut the stems of the flowers rather short. 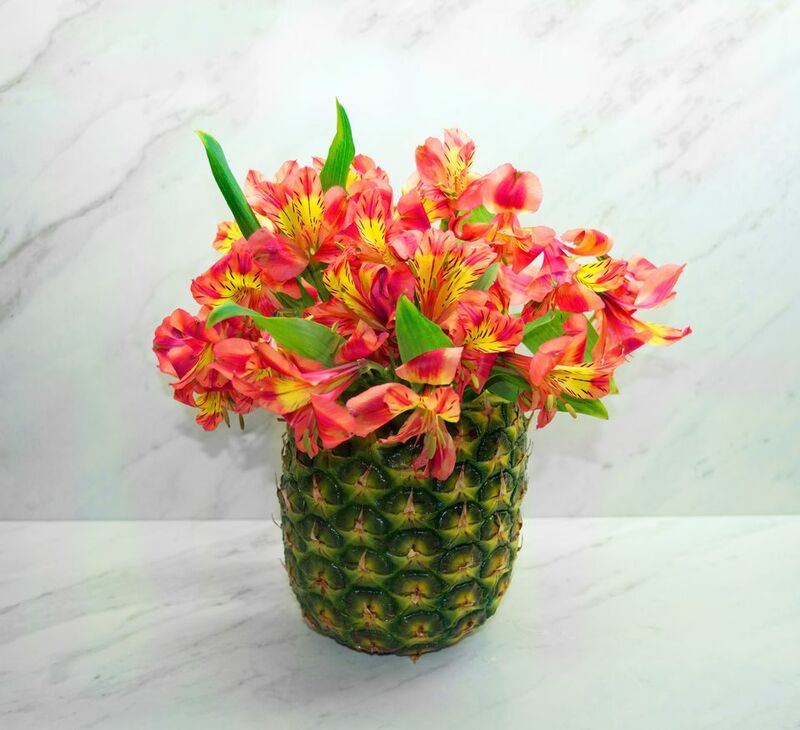 For this arrangement, beautiful Alstroemeria were picked to complement the yellow and green in the pineapple. Best of all these long lasting flowers will keep blooming up to 2 weeks. While any cut flower could be placed inside the pineapple vase, tropical flowers such as Alstroemeria, Orchids, Bird of Paradise, Needle Protea, Hibiscus or Bromeliad look best. Remember to regularly check the vase and add fresh water frequently as there is only a small amount of water in the cup.